You have probably ever heard of best practices to improve your website’s quality and performance (configure a cache policy, enable gzip compression…). However, web performance doesn’t stop to follow general best practices: each technology has its own specific recommendations. Some mistakes are quite trivial, but some others can be painful for your website. The addition of several minor errors can really slow down your final product. That’s why you should always think about performance upstream and during the development step. This article is about jQuery most common mistakes that you may be faced. That’s nessessary to be vigilent when you’re using some front-end frameworks, like jQuery, especially when you handle a lot of data. But which one is the most efficient? What the others really do? This blog post introduces the basics about some good and bad uses of this framework. Here, the figures speak for themselves, aren’t they? Another way could be to extract your element from the DOM (remove() method), treat it and put it back. There are a lot of things to say about the jQuery selectors. Here, I will just talk about the very basics you have to know. More details are available on http://learn.jquery.com/performance/optimize-selectors/. In many cases, libraries like jQuery are used to enhance the user interactivity with the page. So you should consider to load and execute your jQuery code once the user is able to interact with your website, ie after the ATF content is rendered. The code quality topic could be the subject of an entire article, talking about our experiences. But concerning jQuery, you can consider this little tip. I will take a more and more used example: the ajax requests to load content asynchrounously. Sometimes, you are tempted to chain requests. Shorter, more elegant and more readable. And you? 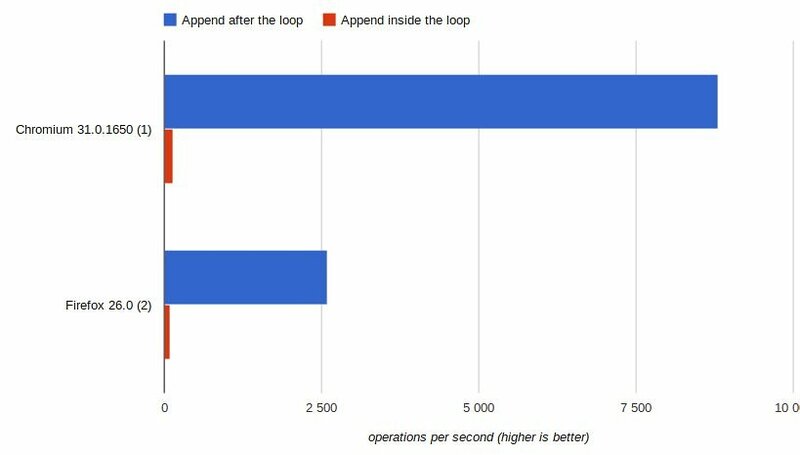 Do you know some jQuery performance tips? Feel free to share them with us! You can also test your website concerning the most of these tips thank’s to the DareBoost online tool! I can’t locate the mistake described in the second part of your comment. However I’ve updated the article according to your first remark. Thanks for the feedback! Here’s a simpler implementation of promise. Absolutely. Your example is better, I update this part. Thank you!